Hotel Chocolat Dasher the Reindeer Gift Basket Review & Competition. I LOVE Hotel Chocolat. It's one of my all time chocolate favourites! When I was asked if I'd like a Christmas gift to review, I was over the moon. I couldn't choose which one I'd like as the choice was just too hard so I happily decided to go for a surprise and I'm so glad I did. My postman delivered this lovely Dasher the Reindeer Gift Basket to my door last weekend and really made my day. 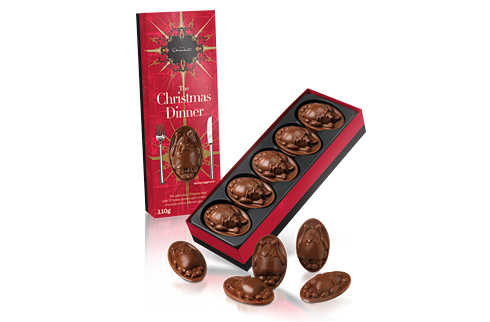 A Christmas Dinner box of ten turkey dinners which are cast in mellow milk chocolate. These went down a treat and with ten of them in a box, there's plenty for everyone to enjoy. A very simple chocolate but tastes great and looks fantastic. Very cleverly made to look like actual turkey Christmas dinners. These are very sweet and were a huge hit with my girls. The box of Tiddly Milk Chocolate Reindeer's are so cute. There's 8 gorgeous little reindeer's for the whole family to enjoy. Who will you find in your box? Dasher and Dancer, Prancer and Vixen, Comet, Cupid, Donner and Blitzen or even good old Rudolph himself maybe? Delicious little Milk Chocolate treats for both the kids and adults. Perfect for little hands but also perfect for Mummies like me too. A yummy Milk Chocolate Reindeer Lick which I had to eat for arguments sake - I wouldn't want them too fight over it now would I? It was a yummy little treat that I enjoyed with my nice cup of tea. It went down nice and smooth. Another delicious item form the fabulous Hotel Chocolat. Also in the gift basket there is a rather stunning Cool Penguin 100g Slab. It's so pretty. I couldn't find a good picture of this one but it can be seen in the main picture above. It's a little piece of chocolat heaven! So creamy and truly wonderful. I Love Hotel Chocolat because they put 100% into every piece of chocolate they make no matter how small it may be. I was so pleased with this gorgeous gift set that I'm thinking I may have to buy a few more now for Christmas. They retail at a reasonable price of £22. You definitely do get the value for your money in this set. Sadly mine has all been eaten by myself and my little ones but who would like to win one of their very own? Here's how you can. 1 - Follow My Blog through Google Friends Connect using the "Follow this site" button over on the right hand side of my blog. 2 - Visit Hotel Chocolat's Christmas range and let me know which item you would buy this Christmas. Once you have done BOTH steps then leave me a comment letting me know you have done so. Like Hotel Chocolat on Facebook and write the following message on their wall "Mummy Of 3 Diaries Sent Me"
Follow @hotelchocolat on Twitter and tweet " @v82chris From Mummy Of 3 Diaries Sent Me"
Tweet the following tweet " I want to #win a Dasher the Reindeer Gift Basket with @v82chris http://bit.ly/tIsBUm "
The Maximum number of entries per person is 4. That's all you need to do and someone will get this gorgeous gift basket delivered right to their door in time for Christmas. Good Luck to all. Competition closes on November 30th and is open to the UK only. 1 Winner will be picked at random using Random Org.Com from all the correct entries. CONGRATULATIONS!!! Please DM me (@v82chris) your details to claim your prize. Been a follower of your blog for ages =) If I had the money, I'd buy The Ultimate Christmas Hamper. How yummy does that look!?! I'm on Twitter @khal_khaleesi...or you can just click on my name to go to my profile. I would buy the Tiddly Milk Reindeeer as they are a bit different from the usual Father Christmas and Snowman treats. I've followed your blog too! I've liked Hotel Chocolat on Facebook. I've also tweeted their message and on their wall. Already follow your site & i would buy The Happy Family Christmas Hamper so we could have a major choccy christmas. I love the tiddly caramel penguins yum! Thanks for this delish competish ! So many lovely choices ... I'd love Hotel Chocolat's Ultimate Milk Chocolate Advent Calendar . It would make a luxurious change ! So pretty too ! I'd buy the Alternative Mince Pies or The Christmas Goody Bag. Although, it all looks so yummy!! I'd buy the chilli and orange yule log as it sounds like an interesting combination and is within my price range!! Tweeted comp link @lisajane13, Lisa Troccoli. follow your blog but cant sign in for some reason so posting as anon .. I have tweeted I want to #win a Dasher the Reindeer Gift Basket with @v82chris http://bit.ly/tIsBUm "
If money was no option I would buy the The Happy Family Christmas Hamper...Looks great!! I have liked and left a message on FB as Kim Carberry. Following your blog via GFC Would like the tiddly caramel penguins! Gfc yonks ago and I'd buy the christmas dinner set! The Winter Desserts sounds like it would make christmas dinner unforgetable. Following your blog. I'd get The Winter Desserts as it sounds delish!! Following @hotelchocolat on Twitter & have tweeted. Tweeted the last tweet too! I an Following via GFC as Hannah Bartram. Have liked and commented on Hotel Chocolat facebook page. Video - My Lily loves to sing. Samsung #GalaxyNote - The Big Launch Is HERE.